Okay, I'm going to jump to the browser and you may know where I'm going with this. In a couple of previous videos, we talked about the theme developer module and it adds this checkbox in the lower left-hand corner. And when we click the checkbox, we can then click on any part of the page to get a dialogue box up here in the upper right-hand corner that tells us what theme function or template file is outputting this content. So I just clicked on the image and it's being output through a function called theme image. So if you wanted to override this function, we would simply need to find the original function definition, copy it, put it in our template dot php file, change the name and then change the output. Let's go ahead and do that just to work through the process step by step. I'm going to go ahead and close out this box here. Now to find where the function is defined, you may need some ability to search through the folders on your Drupal site. There's a nice tool in my editor, I use Komodo to search through a folder but you can also use a command line tool called grep or various other tools. I'm going to jump to my editor. And then I'm going to right click on my folder and select find. Now, I'm going to search for function, theme image and then a parenthese. Now the rationale here behind the search is that I want to find a place where this is defined in particular rather than places where this function name is being called. So I'm adding function at the beginning. And then I'm adding the parenthese at the end in order reduce the number of results because there could be several theme function names that begin with theme underscore image but then continue. So this will narrow down the results. I'm going to go ahead and click find. And it looks like we have a result here, function theme image. And I'm going to go ahead and click this to open up the file. It looks like this is in the theme dot inc file which is in the includes directory. And if we scroll down, we can learn a little bit more about this theme function. It looks like its passed a single variable variables and you'll find this with all theme functions that there is just a single variable being passed to it. It compiles some attributes and then it loose through some various additional attributes and builds them into the attributes array. 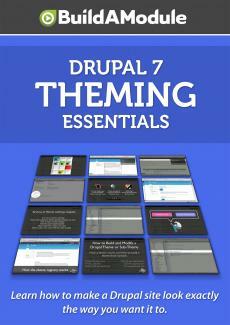 And then it returns this image tag with the attributes rendered out using the drupal attributes function. So if we want to override this somehow we can go ahead and copy the code. We may want to copy the comments as well. Next, make sure that your template dot php file is open. I'm going to go ahead and jump to my directory where I have my sub-theme here. Now I recall from previous examples that we're in sites, all, themes, batoverrides. And I'm going to open up template dot php. And I'm going to scroll down to the bottom and I'm going to paste this function in there and save it. Okay. Now our second step is to rename this function and it's very simple.